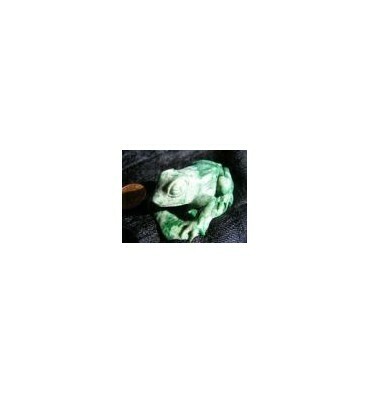 Green and white jade carving of a charming frog. Please allow me to present my friend Lucien. Lucien is unique and was made this year as a masterpiece in our Northern factory. He weighs in at a hefty 43.4 gms and measures 55 x 4 2x 20 mm. Free, Worldwide registered delivery includes a smart presentation box, transit insurance and our complete 30 day replace or refund warranty. He requires no visas to travel or work permits and although extremely self indulgent he will settle almost anywhere he feels loved. Please give Lucien a new home and buy him now.